Infrared is a type of energy. How does infrared heat work? It heats people, floors, walls and other surfaces directly, without heating the air around them first. The result? Infrared heating provides an instant warming, similar to when the sun emerges from clouds on a chilly day. Another important factor to consider in evaluating infrared applications is that the amount of energy that is absorbed, reflected or transmitted varies with the wavelength of the infrared energy and with different materials and surfaces. These and other important variables have a significant impact on heat energy requirements and performance. Infrared Emitters & Source Temperatures — The amount of radiant energy emitted from a heat source is proportional to the surface temperature and the emissivity of the material. This is described by the Stefan-Boltzmann Law which states that radiant output of an ideal black body is proportional to the fourth power of its absolute temperature. The higher the temperature, the greater the output and more efficient the source. With most conventional heating methods (radiation, re-radiation, conduction and convection), air must first be heated and then circulated to warm people and objects. That’s why conventional heating is controlled by thermostats that sense air temperature. As a result, it takes longer to heat people and objects because they’re warmed secondarily to the air around them. Innovative infrared heating warms people, floors and other objects first, making it the most efficient, effective method of heating. It really shines when heating under diverse conditions, such as warehouses, storerooms and even the most immense structures imaginable. Warm people and objects, not the air that then rises to the ceiling. 1. The total infrared energy output increases with more energy being radiated at all wavelengths. 2. A higher percentage of the infrared energy is concentrated in the peak wavelengths. Regardless of brand type or features, infrared heaters typically save energy compared to traditional heating methods. An infrared system’s overall operating efficiencies are proven and measurable. When selecting an infrared tube heater, several key features contribute to its overall quality and effectiveness. Two-stage technology, burner design, exchanger tube properties and reflector material all play a vital role in making an exceptional infrared heater. Independent studies have confirmed fuel savings from 20% to 50% when compared to a warm air system. Infrared heaters burn clean and emit few harmful emissions. 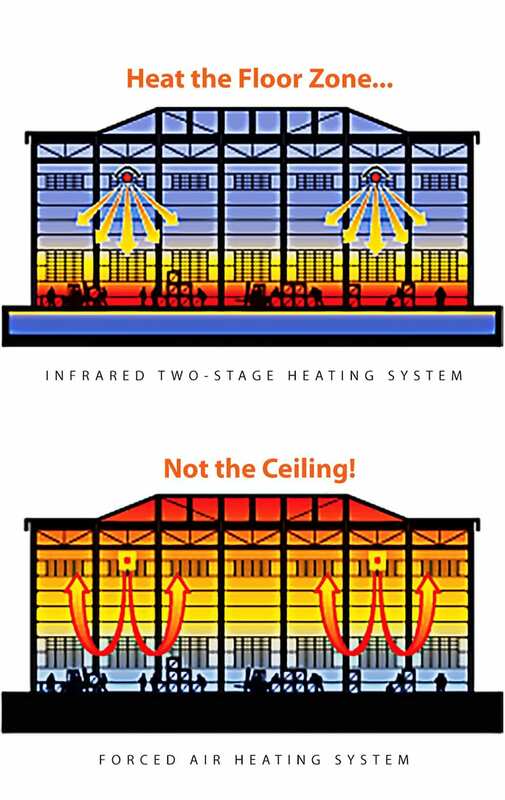 Heat the floor zone; not the ceiling. The heat energy that’s stored within ambient objects improves the comfort levels in the space. Infrared heaters do not rely on air currents to transfer heat. This minimizes the circulation of hazardous particles, chemical pollutants, and cross-contamination of regularly occupied areas. Infrared heaters can be directed where heat is needed. Individual zone controls increase personal comfort for all building occupants. Since you’re not circulating air to heat the inside of a building, wide temperature variances are reduced, increasing perceived comfort levels. Infrared energy stores heat in floors and objects, so people will feel fewer effects of periodic air changes. Low maintenance and quality components ensure a long life cycle.